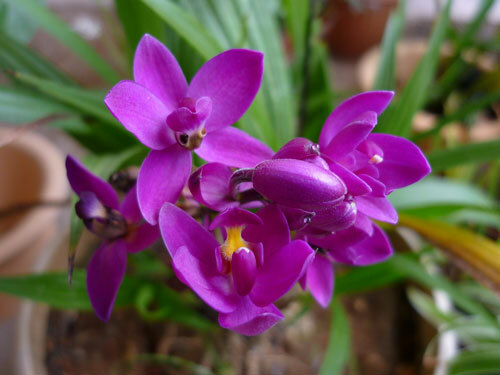 Spathoglottis plicata is a terrestrial orchid sometimes called the Ground Orchid. There are other plants in the genus, but I've never heard of them in cultivation. Use a potting mix suitable for terrestrial orchids. Some people grow them in dirt, but they on't like the growing medium to be compacted. Intermediate temperatures are reasonable, but they're pretty flexible about temperature. (Don't let them freeze, though!) If temperatures are warm, they will bloom year-round. In climates with a cool (but not freezing) winter, they may go dormant at that time if grown outdoors. You can also put them outside just for the summer in cooler climates. They like high light; some people even put them in direct sunlight. (But to be on the safe side, don't!) They also appreciate a fair amount of humidity; 60-70% is ideal. Let them dry out a fair amount between waterings.